The Stag season runs from the first Wednesday in October to the first Wednesday in April. Usually the only reason for changing one is if New Year’s day happens to fall on a Wednesday. The first race of the season saw perfect mild running conditions with very little wind on the evening, but just 14 runners taking on the three lap route. First home in a new personal best was Pete Mackrell who just sneaked past Ruth Mitchell in the finals strides of the race. Warren Rose was third home to pick up 23 points while Stuart Read earned the only other PB of the night to come home 6th. 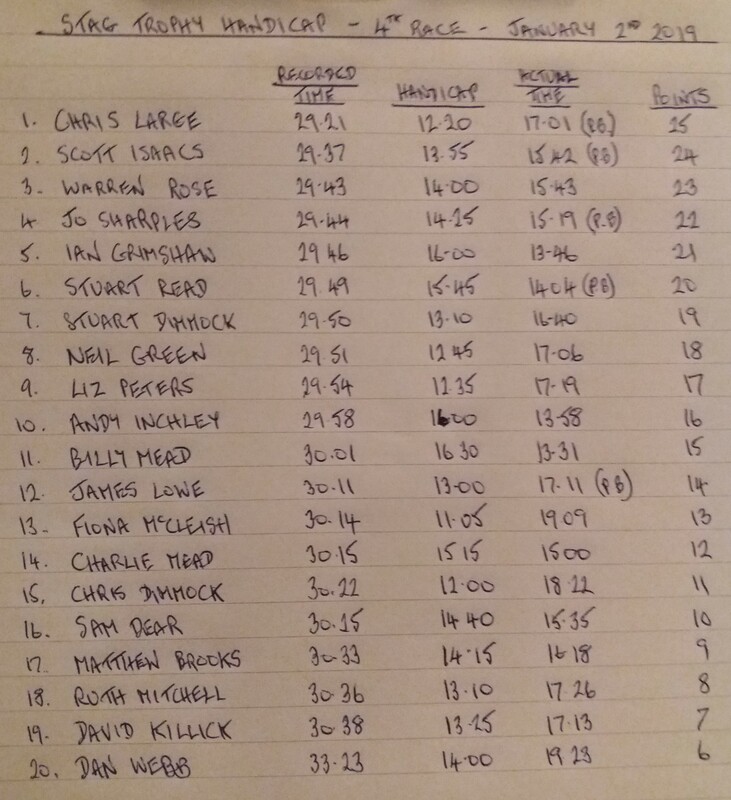 The second race included two PB’s on the night with Ruth Mitchell coming home second behind new boy James Lowe and taking 25 seconds off her previous best from last month. 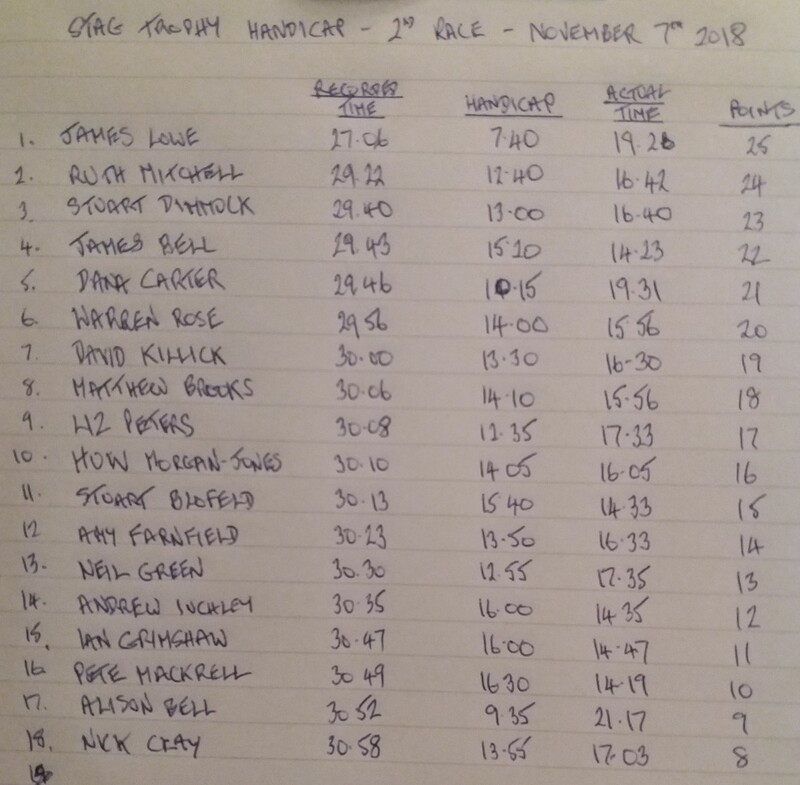 The other was from James Bell who took 10 seconds off his time to set a new club record for V45, taking it from Paul Dimmock (Chris & Stuart’s dad) by two seconds. 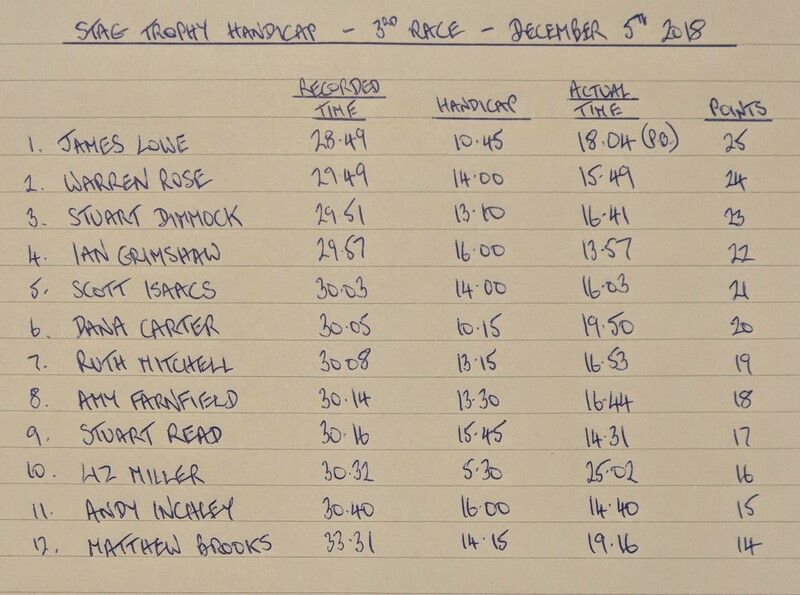 Race three saw James Lowe smash last month’s time by 80 seconds to comfortably win the race again. Warren was second home, continuing his usual consistency and Stuart Dimmock was third. Unfortunately for James Bell, his V45 record lasted just one month as Ian Grimshaw, having just turned 45 ran an excellent 13:57. James, however, does go into a new category in May……. 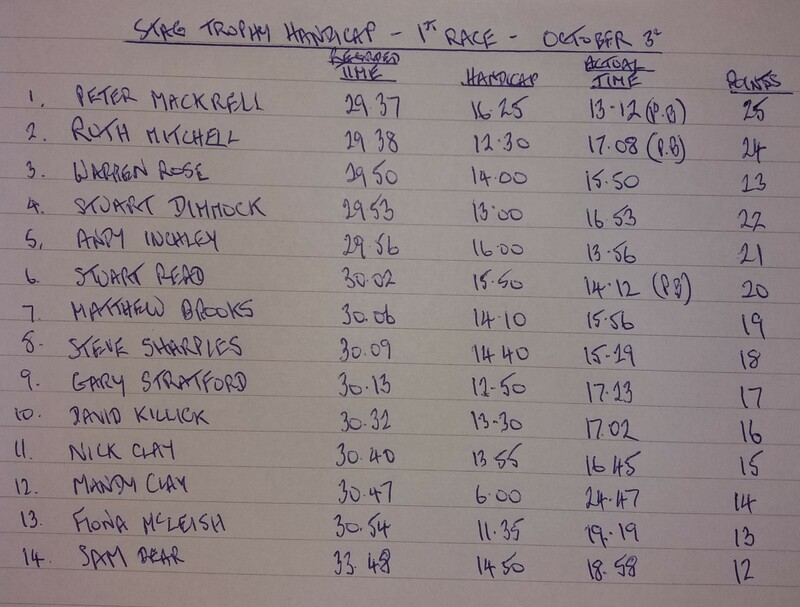 Race four saw the highest turn-out of the season so far with 20 runners diving into their new year training. Almost perfect conditions saw some excellent running with five PB’s set. Chris Large ran a PB by a minute exactly a year after his last PB. He led home new boy, Scott Isaacs, with Warren Rose just pipping Jo Sharples for 3rd place. Jo’s time of 15:19 put her into 2nd place on the women’s all-time list. Other PB’s were set by Stuart Read and James Lowe. Despite being nearly a minute quicker than December James was only able to take 13th place!! 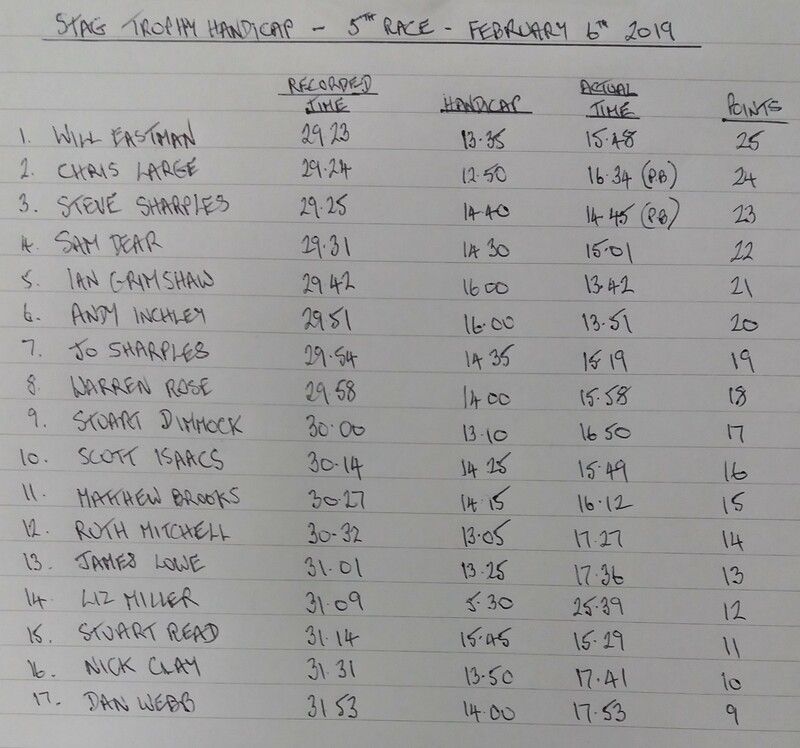 Race five in February saw another newbie (Will Eastman) take the top points away from Chris Large at the death. Chris still ran a big PB and was chased home by Steve Sharples who ran the only other PB on the night in excellent conditions. 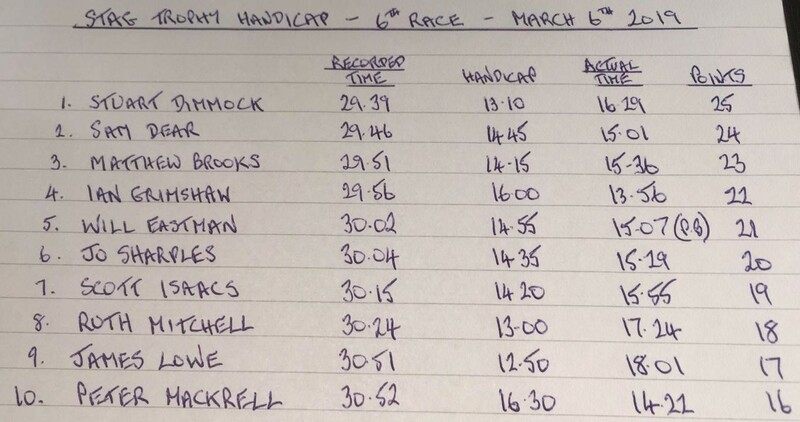 The penultimate race in March saw the lowest turnout of the season to date with a few people missing through injury and some through forgetfulness! The ten runners who did make the start line ran strongly on a breezy night where they earned good points and a couple even managed to achieve PB’s. 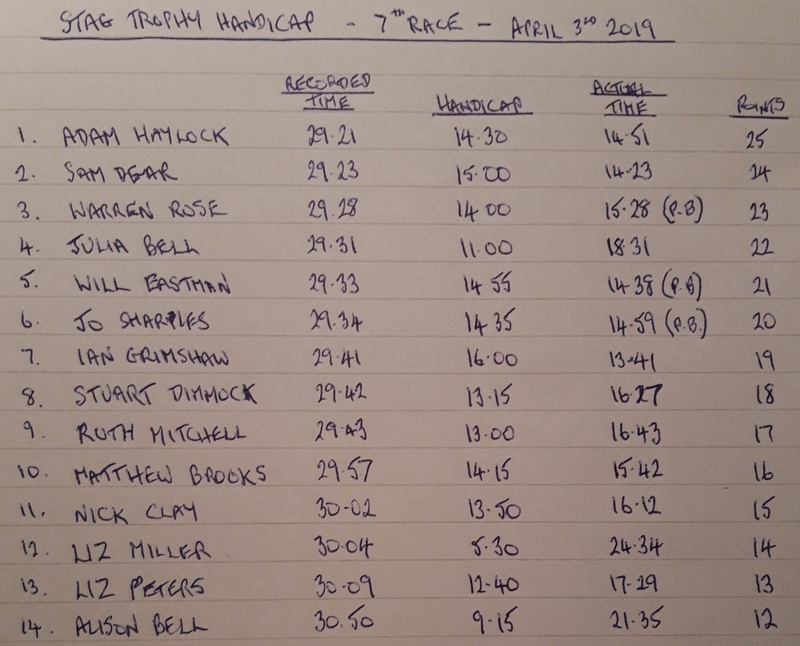 The race on the night was won by Stuart Dimmock who ran a season’s best time to hold off the improving Sam Dear who equalled his time from February. Matthew Brooks was third home in a new PB of 15:36, with last month’s winner, Will Eastman also beating his debut time from February.